Rhodri Morgan. Photo: National Assembly for Wales. 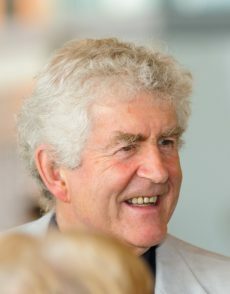 Today at 10.45, a humanist funeral for former First Minister of Wales and Humanists UK patron Rhodri Morgan will be streamed online through Senedd TV for the world to see. The funeral will be led by Rhodri’s friend and former fellow Welsh Assembly Member Lorraine Barrett. Lorraine is also a Humanists UK patron who retired from politics to focus full-time on being a Humanists UK-accredited funeral and namings celebrant. The funeral is the first of its kind in the UK: the first ever public funeral, akin to a state funeral, led by a humanist. Rhodri’s choice is a particularly fitting one for the Senedd’s first national funeral; YouGov polling published in December 2016 showed that 51% of Welsh people are non-religious and roughly 1 million people in Wales share Rhodri’s humanist views. Like Rhodri, one in seven Britons say they would like a humanist funeral when they die. Rhodri and his wife Julie Morgan, another patron of Humanists UK, recently supported the launch of Wales Humanists, a national voice for the non-religious in Wales which is part of Humanists UK. Julie spoke at the launch, which took place in the Senedd late last year. For further information, or to arrange an interview, please contact Humanists UK Director of Public Affairs and Policy Richy Thompson on 07815 589 636 or richy@humanism.org.uk. We operate in Wales as Wales Humanists and are a registered charity (No. 285987). Until May 2017, we were known as the British Humanist Association.